Saudi Arabia has put on hold a $200 billion project to build the world’s biggest solar-power-generating station. The project would have generated about 200 gigawatts of electricity by 2030—more than three times what the country needs every day—beginning with about 7.2 gigawatts within two years. The project had not gotten off the ground before it was halted because of high costs and logistical issues. Saudi energy officials had not decided on the solar project’s key details—the land that would be used, the structure of development, or whether it would receive subsidies from the state. The project’s first phase was expected to cost up to $1 billion. The Saudi kingdom is currently working on a broader, more practical strategy to increase renewable energy that it will announce in late October. Before this project, Saudi Arabia’s energy ministry had begun a solar- and wind-power generation program with the goal of producing 9.5 gigawatts of power by 2023 (about 10 percent of its total capacity). The ministry tendered 300 megawatts of the 2023 goal in February, by awarding a contract to a local private company. 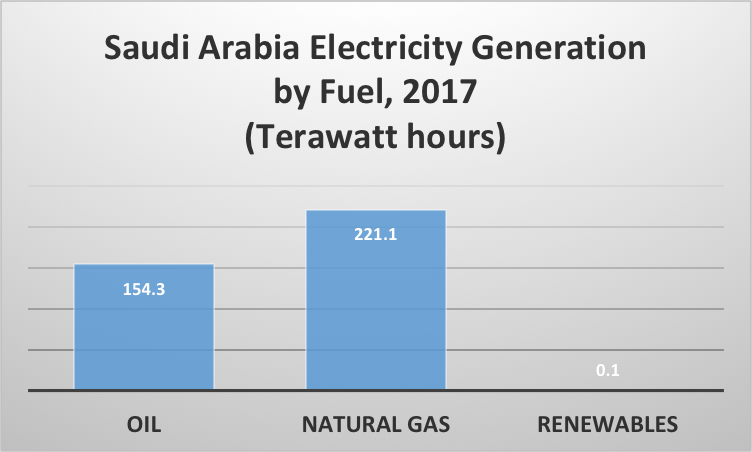 Saudi Arabia currently produces most of its electricity by burning crude oil, diesel, and natural gas. Besides needing to meet increasing electricity demand, which has grown by an average of 6.6 percent per year over the last decade, Saudi Arabia wants to diversify its generating capacity and is evaluating proposals for nuclear power as well as renewable energy. The Kingdom plans to build two large nuclear power reactors as part of a program delivering as many as 16 nuclear power plants over the next 20 to 25 years at a cost of over $80 billion. It has proposed to build 17 gigawatts of nuclear capacity by 2032 to provide 15 percent of the nation’s power. Saudi Arabia identified two possible sites for power stations, on the Gulf coast at Umm Huwayd and Khor Duweihin. The Kingdom is selecting finalists for building the two plants from five countries—the United States, China, Russia, France, and South Korea. The selection of a winning bid and the signing of contracts are expected by the end of 2018. Currently Saudi Arabia consumes over one-quarter of its oil production to power its electricity plants. Due to increasing energy demand, much of the Kingdom’s oil production will be consumed domestically by 2030 if alternative options are not in place. Turning toward nuclear power is in line with the Kingdom’s Vision 2030, which is based on diversifying its economy away from oil and natural gas. The two largest uses of electricity in the Kingdom are desalination and residential cooling. It clearly is more profitable for the country to sell its oil and natural gas and use alternative resources, such as nuclear, for water desalination, whose demand is expected to double in the next decade. Because the domestic price of oil used for electricity generation and desalination is highly subsidized in Saudi Arabia, the revenue obtained by replacing its oil-fired generation with nuclear power and exporting its oil at market prices is believed to largely pay for the nuclear power plant. Saudi Arabia sees growing electricity demand primarily for residential cooling and desalination as a need for diversifying its generation sector rather than use its oil solely for domestic purposes in the future. It is looking toward wind, solar, and nuclear power as new generating sources. Since the wind does not always blow and the sun does not always shine, the Kingdom wisely views nuclear power as a suitable back-up and necessary generating source for the future.